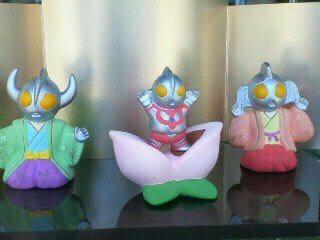 A pastiche that blurs the line between the legend of Momo Taro with the pantheon of Ultraman heroes. One could imagine that centuries from now that large buddha style statues of the Ultra kaiju. Randomly spotted in a shop window on a walk through Kiba.